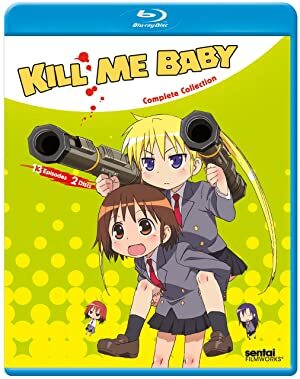 After a short delay the quirky colourful show known as Kill Me Baby is soon to arrive on DVD (and Blu-ray) within the UK; but what exactly can you expect from this much discussed release? Find out in our DVD review. Yasuna Oribe isn’t your typical Japanese high school girl. For one thing, she’s a little slow on the uptake, and for another, her best friend, Sonya, is actually a highly trained foreign assassin who’s in Yasuna’s class as part of her assignment. Though perhaps Yasuna’s definition of “best friend” is a bit strange, as Sonya has the habit of regularly attacking Yasuna, especially when startled. Plot: Yasuna Oribe isn’t your typical Japanese high school girl. For one thing, she’s a little slow on the uptake, and for another, her best friend, Sonya, is actually a highly trained foreign assassin who’s in Yasuna’s class as part of her assignment. Though perhaps Yasuna’s definition of “best friend” is a bit strange, as Sonya has the habit of regularly attacking Yasuna, especially when startled. However, as noted, Yasuna isn’t exactly the sharpest tool in the shed, and while Sonya knows precisely what to do with every one of those sharp objects, even she is hard pressed to deal with the day to day oddities that seem to fill their class schedule. Things like: escaped bears, voodoo curses, juggling and killer mosquitoes. And puppet shows. And just in case Yasuna’s life wasn’t weird or hazardous enough, there’s her ninja classmate, Agiri, swarms of bees and assassins targeting just about everybody, a mysterious red-haired girl with a personal vendetta and the perils of slipping in the public bath.